Already a Member of The FLOCK or The FLOCK Lite? CLICK HERE to access your account information or to change your password. 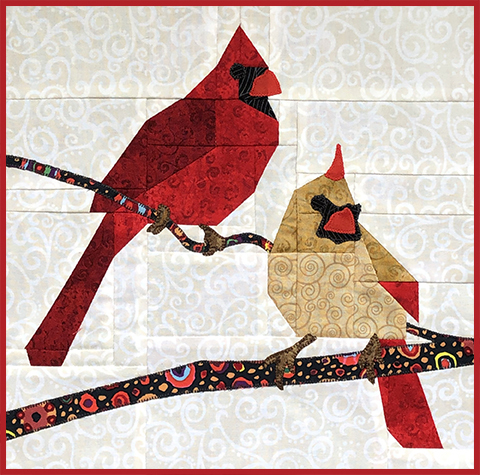 Are you a quilter who loves birds? 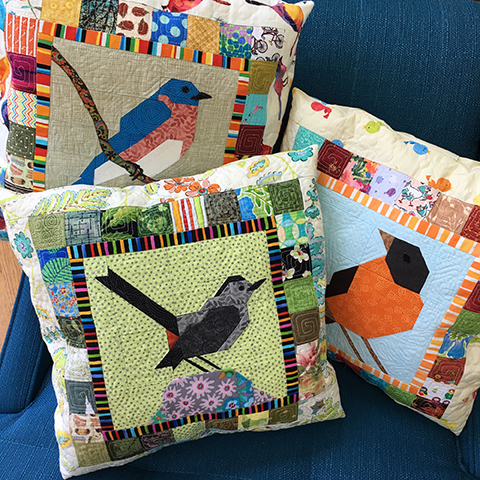 Or a birder who loves quilts? Then, perhaps The FLOCK is for you! The FLOCK is a monthly membership program–one detailed bird block kit delivered to your mailbox each month. The kit is 100% precision laser pre-cut and ready to sew. The first official block kit was delivered in January 2018, but no one is ‘behind’ and it’s not too late to get started! There is no hard-and-fast start date and no hard-and-fast end date to The FLOCK. – It’s not a defined plan for a specific quilt pattern. There is no ‘everyone makes this’ quilt setting layout plan. However, your membership includes periodic setting suggestions and bonus layout patterns. From month to month the blocks will vary in size — most of the blocks are 8×8″ square, but block sizes may be different – some will be larger and some smaller to accommodate a variety of bird species. After all, it would be rather uncomfortable for an ostrich if it had to fit into the same size block that a chickadee would fit into, wouldn’t it? In addition, the blocks may vary in difficulty from month to month. 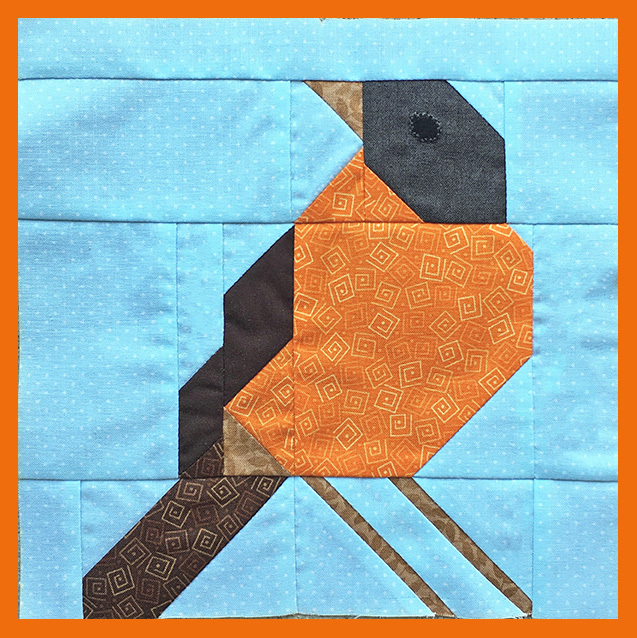 The Beta-Birdies – the small group of quilters who sewed blocks for the three months prior to The FLOCK launch in January 2018 – agreed that the American Robin is a good representation of the blocks in the series, and it’s a classic with fewer and larger pieces than some blocks may have. I like to recommend that the American Robin is a good place to start. Therefore, you may choose from three options to start your membership. 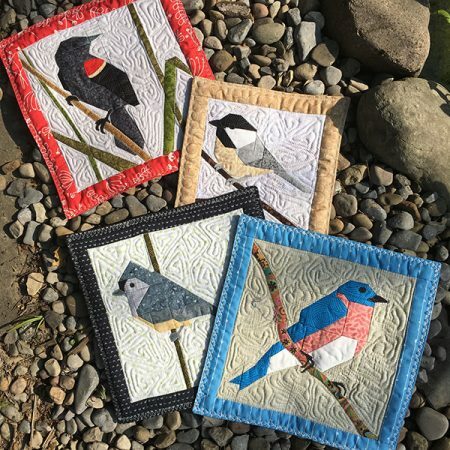 After the first month, your membership will continue with a new bird block kit shipped per month. The new bird for the month isn’t revealed before it is shipped. – Precision pre-cut fabrics, curated to represent each bird species. 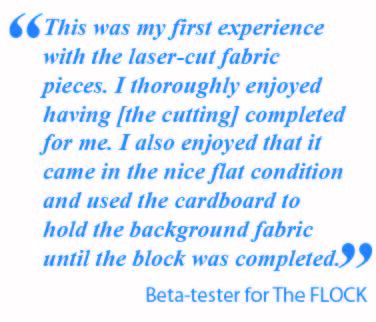 – Precision pre-cut and pre-fused fabrics for applique pieces required for the block construction. Generally speaking, the blocks are patchwork pieced. 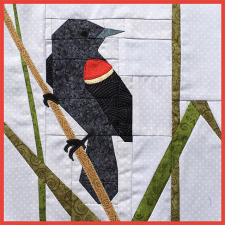 Sometimes a minimal amount of fusible applique is needed to fill in details like eyes, special markings or tree branches. – A Practice Unit to make. Included with EACH block kit, EACH month. 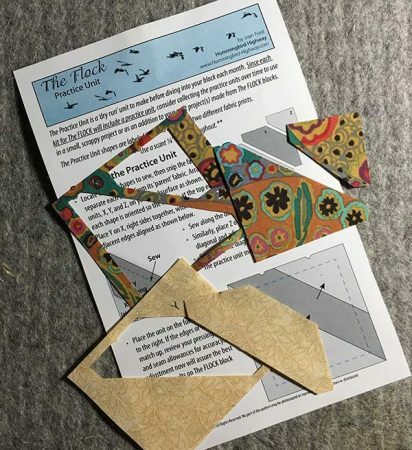 The Practice unit includes fabric, detailed practice unit pattern, and tips for a successful piecing experience with the laser cut blocks. – Full-sized templates sent via email approximately one week after the monthly shipment. Use the templates to replace an element, if needed, due to a sewing error, or make an entire block or blocks from your stash. – Access additional block kits to purchase. 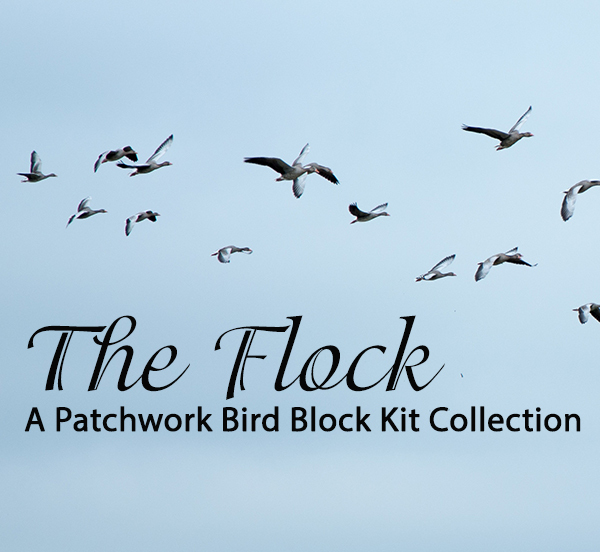 Current and past blocks are ONLY available to members to The FLOCK. The monthly rate which provides access to all the benefits listed above for The FLOCK is $29.95 per month. The subscription will renew automatically. You may stop at any time. Join! 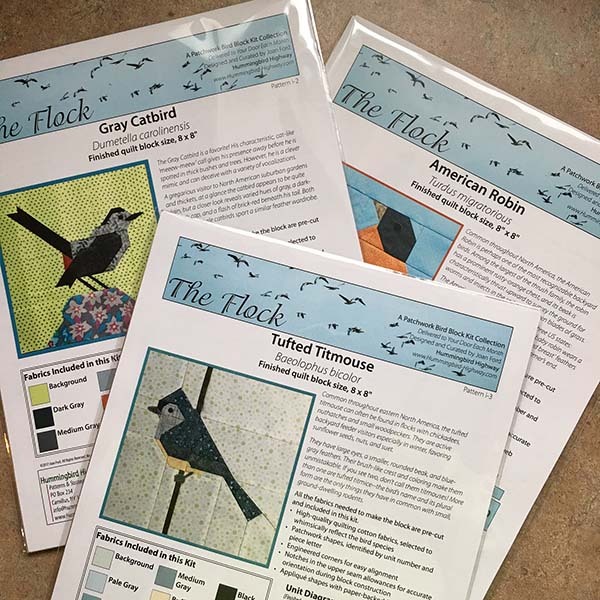 Your membership becomes active right away, and you’ll receive access to exclusive content and kits for blocks that preceded the start of your plan, including the Gray Catbird and the Tufted Titmouse (on the right). Only members can access these extra goodies. IMPORTANT, regardless of when you join, if you join The FLOCK by the 10th of the month, your first blocks will be mailed on or around the 12th of that month. Note that, while your credit card will be charged, you won’t receive shipment notification for your order until the monthly block is shipped (around the 12th of the month). Members who join after the 10th of the month will receive their first block in the following month’s block shipment. Your card will be charged on the same date each month. Every effort will be made to keep the newest bird from being revealed online until after it arrives in your mailbox. 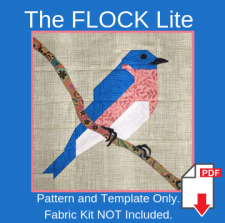 What if you want to join The FLOCK, but you don’t mind the cutting or choosing the fabrics? The FLOCK lite is also a monthly membership program– the same detailed bird block patterns as The FLOCK, delivered each month in PDF format, one year after the original kit pattern was released in print and kit format. There is no hard-and-fast start date and no hard-and-fast end date to The FLOCK Lite. Precision laser cut pieces and a Practice Unit inside each kit! It’s not a defined plan for a specific quilt pattern. There is no ‘everyone makes this’ quilt setting layout plan. However, your membership includes periodic setting suggestions and bonus layout patterns. From month to month the blocks will vary in size — most of the blocks are 8×8″ square, but block sizes may be different – some will be larger and some smaller to accommodate a variety of bird species. – Full-color, detailed pattern in PDF format delivered to your e-mail moments after your purchase is confirmed in PDF format. – Full-sized templates in PDF format sent via email approximately one week after the monthly shipment. 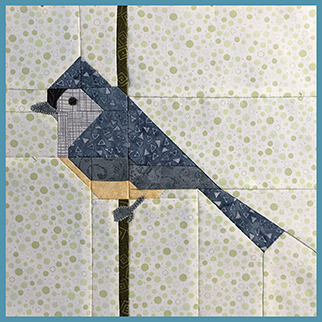 Use the templates to replace an element, if needed, due to a sewing error, or make an entire block or blocks from your stash. – Access additional block pattern files to purchase at members-only pricing. The monthly rate which provides access to all the benefits listed above for The FLOCK is $14.95 per month. The subscription will renew automatically. You may stop at any time. Join! 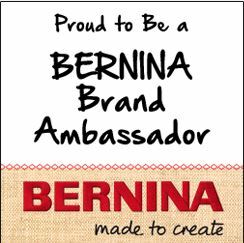 Your membership becomes active right away, and you’ll receive your PDF files almost immediately after your purchase is confirmed. Access to exclusive content and previously-released pattern downloads at members-only pricing begins immediately. Note that your credit card will be charged on the same date each month and your block delivery will occur shortly thereafter. Unfortunately, we can not issue refunds for delivered patterns. What if you only want to give The FLOCK a try? Yep. You can do that, too! 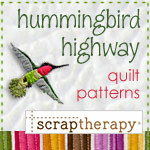 CLICK HERE to review your options to purchase a kit or a pattern/template download. 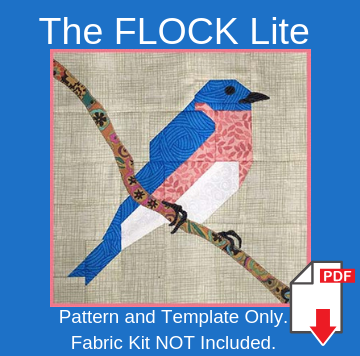 Keep in mind that special pricing for The FLOCK kits and The FLOCK Lite downloaded patterns and templates is reserved for members. Join The FLOCK or The FLOCK Lite to receive member benefits.